This review will be a totally different one. This time I will add my general opinions about reviewing concerts. I will also try to explain why I am giving up reviewing concerts after this last one. But before that I really would like to give you some details about a fantastic concert held on January 12th. I should confess that I was already a fan of these two great musicians. I have their ACT discographies as well as some previous records and listen to them frequently via these good records. 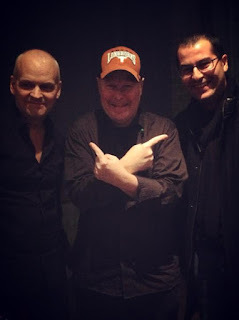 (As most of you know Ulf Wakenius was a member of Oscar Peterson Quartet.) Although I am sure that you have heard about them in many ACT albums I should mention that they are fundamental figures in European jazz scene. Besides performing in main stream jazz concept, in last 10 years, they both really proved themselves in a unique sound of a mixture of folk, jazz, rock and classical especially in Nordic bands and projects. Having many individual albums on ACT label, they also have many records together especially in Ulf Wakenius' albums. Therefore, when I heard about Duo Extraordinaire including these two magicians, without any doubt I booked my flight from Ankara (capital of Turkey) to İstanbul on a snowy weather. I was really wondering what will happen when violoncello and double bass of Lars Danielsson meet with guitar of Ulf Wakenius. To start with; it was heavily raining just before the concert in İstanbul and I can tell you that I arrived at the Borusan Müzik Evi on İstiklal in a real purified mood, clearly washed by hands of God after a long day started with an approximately one hour flight specific for the concert. I can easily say that the small performance hall of Borusan was completely full. One of the reason for this is that Lars Danielsson is a very well known figure in İstanbul in last two years and really loved with his familiar and lyrical sound. The concert was planned in three distinct parts by the musicians. First we have listened solo parts of Lars Danielsson and Ulf Wakenius respectively. The third and longest part was their duo configuration. Lars Danielsson's solo part included a Joni Mitchell cover as well as pieces from his first album Libera Me. The unique sound caught by Lars Danielsson by means of some effects connected to the double bass and his wonderful violoncello performance were remarks of his solo performance. His sound (like some sophisticated screams) was just like coming from heaven. As far as I have heard, he also used some loop effects to support the melody with his own rhythm. Ulf Wakenius has introduced to the scene by Lars Danielsson as a remarkable guitarist. He started his solo performance with Witchi-Tai-To of Jim Pepper, which we are used to listen from Jan Garberek. He defined the piece as meeting of Swedish Culture with Indian North American one. The arrangement was extremely live and perfect in my opinion. Every guitar player should closely analyse Ulf Wakenius' technique. You should really have to see his wonderful vocal parts and Texas Longhorns hat. He added some "Borusan" and "İstanbul" words into the singing. Then, he played Blues for Oscar Peterson but this time as a present to Önder Focan, a famous jazz guitarist in Turkey, who was also with us at the concert. We could also listened an Egberto Gismonti composition from Ulf Wakenius. He ended his solo part by a song called Indian (or Hindistan) blues in which he played his guitar by using a glass for pressing on the chords resembling an Indian instrument. Their duo performance is started with Praying of Lars Danilesson of his wonderful album Pasodoble. This album is originally recorded with the perfect Polish pianist Lezsek Mozdzer and it is one of the best albums of ACT label. Considering the strong character of piano in the original composition, the arrangement with guitar should normally have some handicaps. However, Ulf Wakenius managed to survive with his instrument and performed the defined arrangement very well. The following Pasodoble and Liberetto gathered many applause and appreciation from the audience. The Nirvana cover Come As You Are, literally rocked the İstanbul audience and made the night a memorial one for them in my opinion. The tension in the performance were incredible and the bow performance of Lars Danielsson was unforgettable. A similar piece to the first performance of Lars Danielsson's solo is played again this time as a duo previous to the last piece Breakfast in Baghdad. Ulf Wakenius used a bottle to hit to the bows of the guitar near to the end of the performance as a kind of percussive effect. The encore performance was dedicated to Pat Metheny. The night is ended with many album sales as far as I have seen. I have found the opportunity to meet Ulf Wakenius at last and have a small talk with him. He recognized my name by means of social network. I have heard that the airport lost his luggage in Frankfurt. This is interesting for me, whose wife lost her luggage in the same airport on the same day. We already met Lars Danielsson after some concerts in İstanbul. Since Ulf Wakenius does not know that I am also in contact with Lars Danilesson, he is surprised to learn that Lars Danielsson knows me. Then there came the most funny part from Ulf Wakenius. He first described me to Lars as "He is active" considering my social network activity. However when he learned that I am also known by Lars Danielsson he turned out and said "He is radio-active". 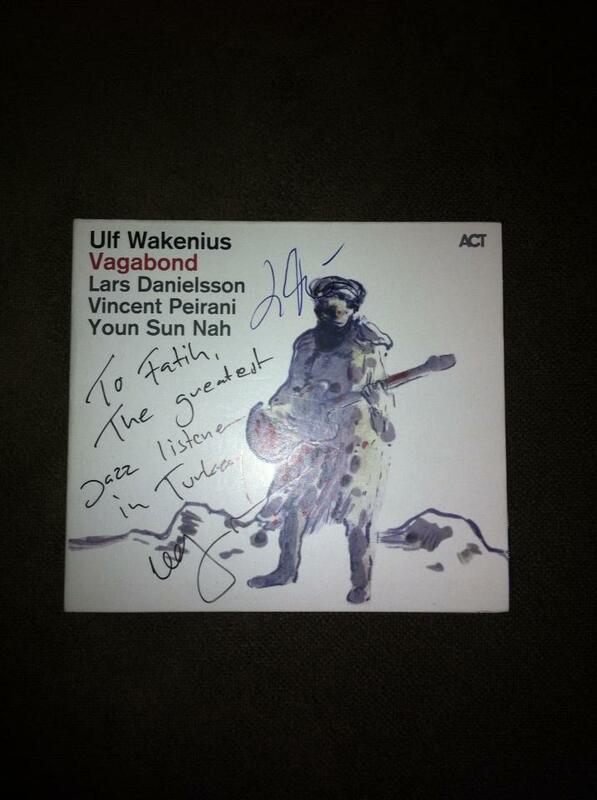 Then I got my best autograph so far on his Vagabond CD: "To Fatih, the greatest jazz listener in Turkey". What can I tell you more. I wished them nice flights and return to crowded İstiklal of İstanbul, like nothing has happened. I returned back home by another flight with a fully satisfied and happy heart carrying lots of melodies. I really would like to listen to them soon together. I think this duo configuration of two amazing musicians has lot more to do. Dear my readers, I also have to tell you that I won't write any concert review anymore here in my blog. The reason is a bit complex but I can tell you that I am a bit tired to share my mind and heart with people. I feel like my concentration is not as it was before. Each time I go to a concert, automatically words start to appear in my mind as some review components. Before this blog thing, I was just listening to music during live performances. It was me and the musicians in the interaction. The sharing was only within this path. There were no need to share what I feel. I know somebody should write about music but for me what I feel is more important than any other thing. I am not totally sure yet but I have decided to give up for some time. Don't worry, I will go on reviewing some albums from time to time. But for concert, I just think that to give you something I started to lose something such as my concentration and passion. Thanks for all your ideas, comments and interests.